Tobi Duggin, 5, is a leukaemia patient with his monkey from the Monkey in my Chair initiativ from the Cure Starts Now. 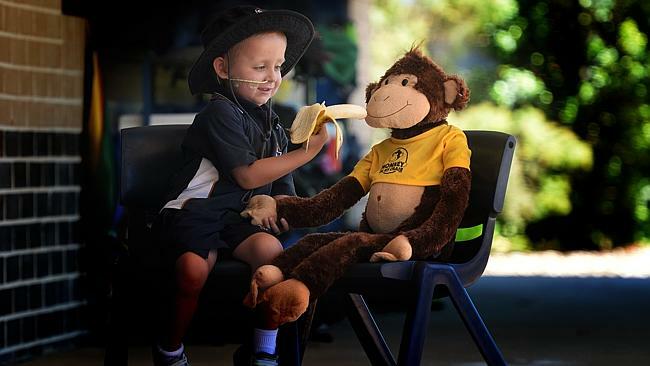 WHEN cheeky little monkey Tobi Duggin goes away for his leukaemia treatment, the brave boy will know there's a special friend keeping his chair warm at St Clare's Catholic School. Tobi, 5, is the first Townsville recipient of the Monkey in My Chair program, an initiative supported by charity The Cure Starts Now which has just received a $10,000 Westpac Foundation Community Grant. As well as the giant monkey which will take Tobi's place at school, he has received items including a smaller version of the toy which he can take with him to hospital, a resource book for his teacher with tips on supporting sick children and a photo album and diary which his classmates can fill in to let him know they're thinking about him. Tobi said he was very impressed with his new monkey friend. "He's going to sit in my chair," he said. Principal Kath Tarttelin said Tobi was excited to learn if he needed to go away again the monkey would be making sure he didn't miss out on any of the excitement at school. "The classmates can acknowledge there is a student missing and keep that student in theirprayers and thoughts," she said.